The wet-then-dry-then-wet-then-wetter-huh? Last weekend’s IndyCar race was predictably crashy, so it’s always nice to see to see a driver make a nice save for a change. Here’s Juan Pablo Montoya getting a dab of oppo when the rear end of his car got loose exiting pit lane. If there’s anyone capable of saving a car from coming around into a wall or another car on the tight streets of Detroit, it’s this year’s reigning Indianapolis 500 champion. 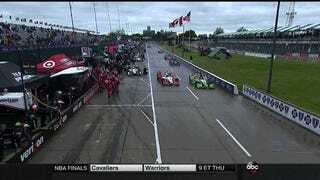 More drifting and less crashing, IndyCar. This is what the fans want.